The Ninazu is the Gallente Force Auxiliary. Like the other Force Auxiliaries, the Ninazu is focused around providing remote repair support to its fleet. 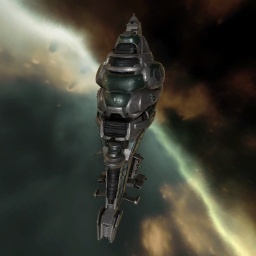 The Ninazu is unique in that while it relies on capital-sized armor repairers for its own tank, it can provide both shield and armor repairs to a fleet. Since the Force Auxiliary-specific Triage Module prevents the Ninazu from receiving remote support of any kind, only the Ninazu's local repairers or tank modules have any influence on its survival. The Ninazu's capacitor booster bonus allows it to utilize an impressive active burst tank, so long as it can feed its cap-hungry armor repairers with cap boosters. Further information about additional or recommended skills to pilot Ninazu for a specific or it's common role(s) can be written here. A basic wormhole or K-Space fit. Bring logi bots and some light drones. May be fit with five capacitor boosters. Bling to taste: most wormhole ones (nearly all) are fit with the top tier equipment. Not good for a suicide triage carrier or for large capital brawls. For W-space some are triple rep with a Reactive Armor Hardener: utility high slot to as preferred. No sub-article about Ninazu roles or piloting tactics. You can write them here. This page was last modified on 16 April 2018, at 15:27.